Airsoft and optics, the fascination started way back when skirmishers started looking for aiming options beyond the "irons" their replicas were fitted with. Years have passed and ever pleasing manufacturers answered the call of airsofters for optics that not only get the job done but also look either cool or look like the real deal. In most cases they managed to encompass both philisophies. We all know or know of Leupold Stevens, the US based optics manufacturer and one of the prime suppliers of "glass" to the US military. As Leupold optics could be seen, observed and spotted in online photos & video clips from various theaters of operations,as well as being featured in many movies and tv series, ACM manufacturers were the first to offer airsoft replicas to the ever demanding market. These copies in some cases only vaguely resembled the original Leupold scopes and in other cases they were quite detailed copies. Don’t get me wrong, we’re talking about looks only not the quality or performance of the optics in question. There is a reason why quality combat optics cost so much, the reason is, they are built to last as opposed to the airsoft optics which are more or less built to resemble. As mentioned before, ACM manufacturers were pretty quick to offer Leupold replicas. The most offered models were simply called M3 scope, despite using M1 turrets on some versions. Most were copies of the 3.5-10x40mm scopes, later came 4-14x50 versions, some had the M3 turrets, some had the M1 turrets. These scopes are rather large and fit nicely on a full size M16 or the M14, however on your short M4, these scopes look gigantic, cumbersome, too big, odd even. As the militaries started fielding re-designed big game hunting scopes like the S&B ShortDot, the Nightforce Compact NSX optics, the trend in airsoft slowly started to shift to compact size militarized big game scopes. As soon as pictures, rumors and reports of Delta operators using the ShortDot started circulating the interwebs and various instructors such as Chris Costa and Travis Haley either started using or recommending such scopes for mid range work the compatc size, militarized big game scopes became quite sought after in airsoft. 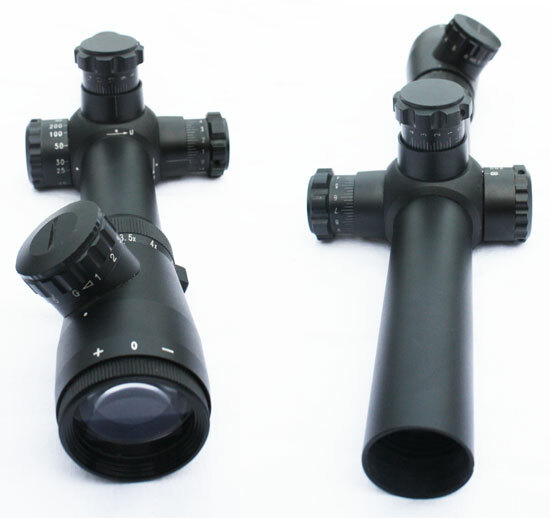 The other very important factor for these scopes becoming very much in demand is that the existing ACOG, Elcan and SUSAT replica scopes all but a few had one major flaw; too short eye relief. This meant that if you wanted to use some authentically looking magnified optics, you literally had to make contact with the rear lens of your scope and your safety google. And in some cases even that was not enough to get a clear sight picture. And again, the ACM manufacturers were the first to offer a solution, well kinda. You see, the ACM manufacturers already did have the parts, components and the tools to make the Mark 4 series of scopes, the M3 and the M1 versions. 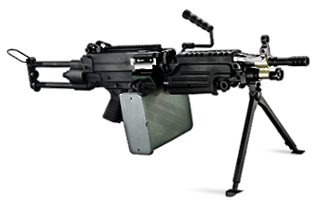 Designing a completely new scope that would resemble the ShortDot or the Compact NSX would be time and money consuming, so they took a shortcut, that worked rather well. They took the already existing 3.5-10x40 Mark 4 scope with M1 turrets (...M3 or M2 would work much better) and shortened the front end of the tube, narrowed it down to accept the 25mm front lense and voila; enter the 3.5-10x25 scope, complete with Leupold markings, that are not correct at all, but add to the authenticity as well as a Leupold packaging box, at least the outside looks like it. Perhaps at this point it would be smart to point out, that no such Leupold scope exists. The closest thing would most probably be the Mark 6 or the Mark 8 series of scopes. So, now that we’ve covered the how this scope came into the existance, let’s take a look at it. We have tested this scope for a few years, broke one or two while testing them on real weapons, purchased some more and used these on a variety of airsoft replicas. And yes, they are that good, some even survived a few months on various AK’s, chambered in 7.62x39, 5.45x39 as well as 5.56x45, real firearms, not airsoft replicas. But not all of them. However, all of them survived on any airsoft replica we fitted it on to, taking years of abuse in the simulated battlefield and passing the airsoft test with flying colour. First the name, the proper name of it should be A.C.M. 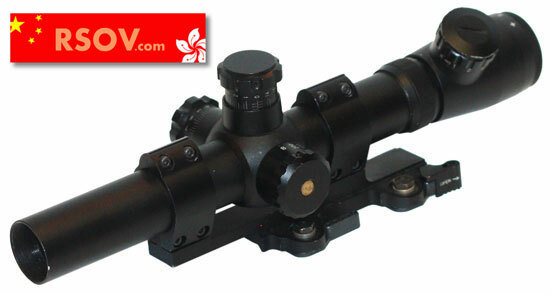 Leupold Mark 4 3.5-10x25 R/G illuminated mil-dot rifle scope (Leupold 3.5-10x25). 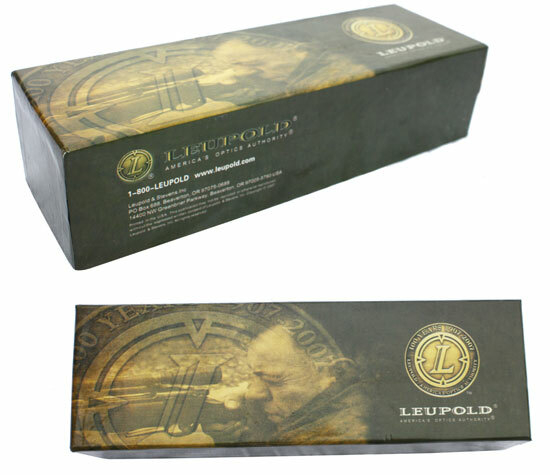 The scope comes packaged in a box that has all the Leupold Stevens graphics and markings, while the packaging inside reveals the lack of any padding or an attempt to copy Leupold as far as presenting the optics in the box. There is just a scope in a plastic bag, a cloth for the lense, some cheap 30mm mounting rings and an allen key. Nothing to be impressed with or excited aboout except the scope itself. While it will put many off, as such a scope does not exist in Leupold lineup of products, the quality and functionality is superb to pretty much any airsoft scope out there. The markings on the bottom of the scope indicate that the scope in question is the Mark 4 with M2 knob turrets, made by Leupold. The serial number is not individual or unique. The actual adjustment knobs are copied from the M1 models and not M2 as the bottom inscription specifies. 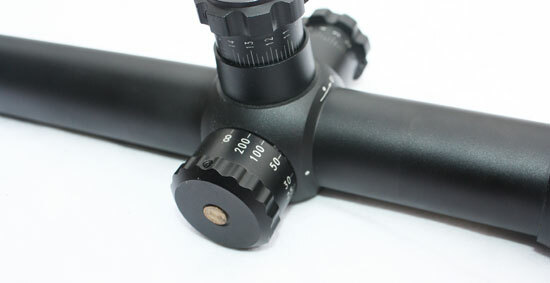 The scope sports a 30mm tube which means a propper 30mm mount or mounting rings will be a must. We used the LarRue 1.5 QD mount for mounting it on the AR-15 type AEG. The magnification range goes from 3.5 all the way to 10 power. While the 3.5 is most usefull, 10 power can be used to scan for targets or simply observe things at greater distances. The zoom ring is somewhat stiff, but since most will use the 3.5 setting in airsoft, this is not really an issue. 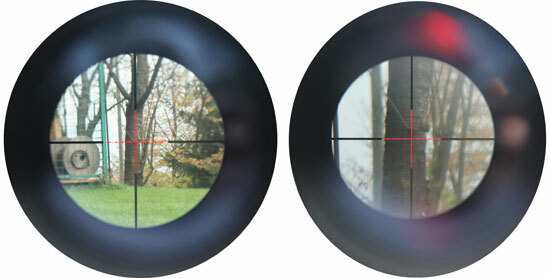 The reticle is standard Mil-Dot and it is illuminated. The Mil-Dot reticle has 4 mil dots in every direction of the reticle and is glass etched, which adds to durability. While the reticle itself seems very Mil-Dot like, I doubt it can be used for range estimation as it is most likely not calibrated to Mil-Dot standards. The illumination has 5 settings in two colours, red and green. The highest setting illuminates the whole internals of the tube with a strong glow but can be used on a sunny day with great effect, the lower settings are usefull in darker areas or indoors. The illumination is powered by a single button battery, the standard and easily obtainable, 3V lithium, CR 2032. Looking at the scope from the rear lens, there are three adjustment turrets on it. Starting on the left side, we have the paralax adjustment knob, this knob actually works and sets in which distance the reticle and target will come into focus. The markings on it are in yards and start at 20 and go all the way to 200 and finally to infinity. 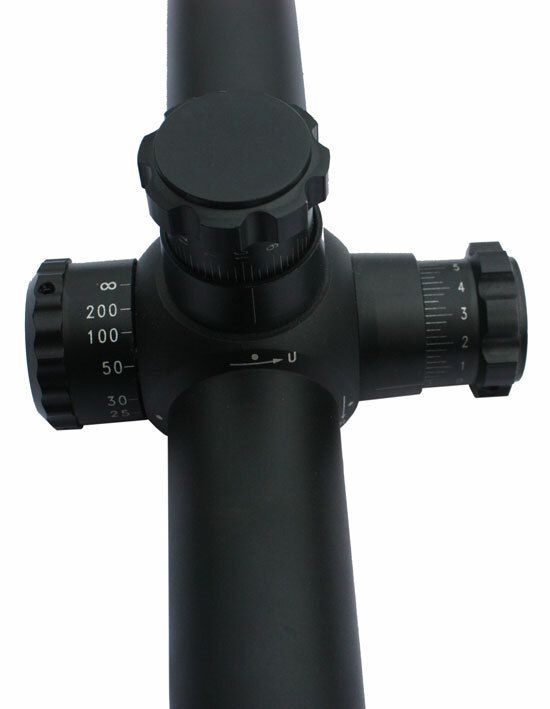 The M1 adjustment turrets are located on top and on the right side of the scope tube. They have no indication of the click increments, but they seem to be 1/2 MOA clicks. Adjusting is easy, maybe a bit too soft for any hard use as one can quickly change the zero while handling, carrying on a sling or transporting the replica with this scope mounted on it. The adjustment knobs on the turrets are of the M1 type, they are solidly constructed and give positive clicks when turned or adjusted. The sight picture is fairly clear, extremely clear for ACM optics to be honest. The eye relief is very generous as I mentioned before. I get a clear sight picture with my head moved back as much as 7 centimeters from the rear lense. The rear lense features a fine focus adjustment feature to fine tune the sight picture according to your personal setting. 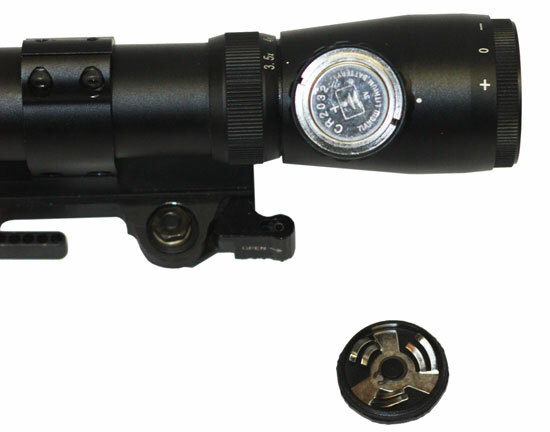 This scope is a good choice for anyone who needs a longer eye relief magnified optics and does not play CQB much, at least not with the particullar replica that has this scope mounted on. The 25mm front lense poses somewhat of a problem as KillFlash units are hard to come by but at the same time offers a smaller front cross section which means a smaller target. There are aftermarket flip up lense covers available, you’ll probably able to find only original Butler Creek that will fit the front lens or perhaps Vortex as it has a similarly sized scope. Vortex Optics also offers a KillFlash solution which might in conjunction with a flip up lense coveractually work on this scope. Mounting it on a sturdy and good looking scope mount such as LaRue or KAC (...we’re talking replicas) you get a perfect height and cheek weld on a AR-15 type of replica. So, why chose this scope over the 40mm front lens variant? In my opinion the main reason being lower weight and a compact size. All the scopes were provided by RSOV, special thanks go to Keith who was kind enough to find us these optics, when we needed them. Also, RSOV seem to be the only reliably source for these scopes at this time. There is also a version with integrated laser, which seems quite odd, but it’s there if you need one. The final verdict is off course a very positive one, one of the best optics for a DMR or something similar, as it offers the versatility, ruggednes and price/performance. Get one if you can, you will not be surprised.